I've been rather under the weather for a couple of weeks. I'm not playing for sympathy, it's just an explanation of why I haven't done much fishing. Anyway, last sunday was the AGM of B.A.S.S.. I've been a member for many years and although it's a fair old hike up to Gloucester, I felt it would be nice to see a few of my pals who live in other parts of the country. The only real problem was that the day of the meeting coincided with me being almost recovered and with a good early morning tide - the weather looked to be set fair. I decided that I could probably go bassing before breakfast and then make my way up to the meeting when I got back from fishing. My pal Nigel was keen to have his first bassing session of the year so we arranged to meet down at the coast at about 04.45. On arrival it was a bit like Piccadilly Circus. Clearly everyone else had thought the same as us and there were probably eight or ten anglers arrayed in the gloom along a mile or so of shoreline. This might not seem much but believe me it felt a bit like fishing shoulder to shoulder. Anyway, we started spinning fairly near to our friends Rob and Mike who had just beaten us to the chosen spot. 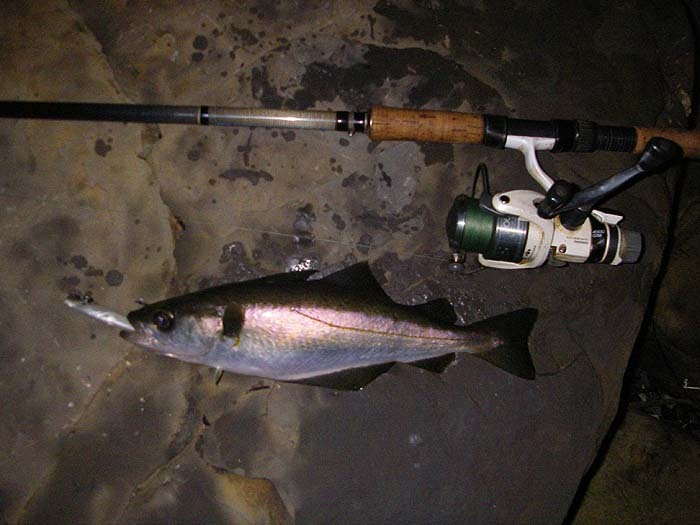 It started very quietly and for perhaps ten minutes I cast and retrieved my weighted Redgill into the dark. It was more or less flat calm and even in the darkness I could see that the water was gin clear. Eventually I felt a slight double tap and decided that it was probably a fish. This perked me up and I concentrated a little harder. Another couple of casts and suddenly I was into a fish. No bass this, I thought, as it flapped and wriggled its way back towards me. Sure enough it turned out to be a nice fat little pollack. I took its picture and put it back before resuming my operations. As the sky began to lighten I had several more feeble attacks on the lure but failed to hook any of them - more pollack I guess. 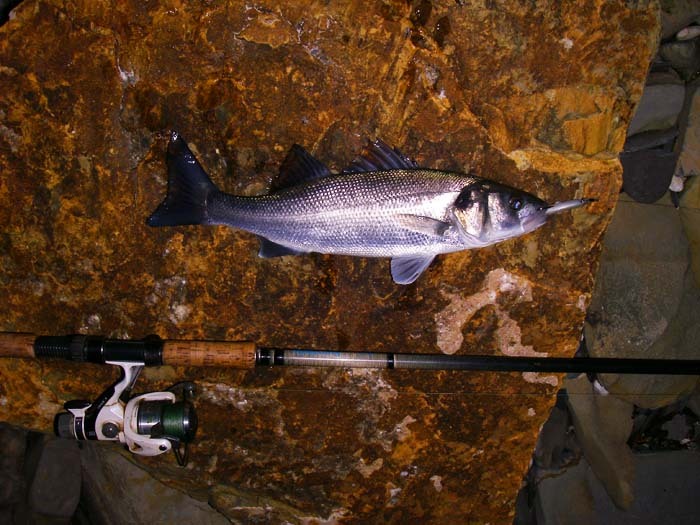 Then, just at the 'witching hour' as I began to see the lure splashing down at the end of my casts, there was a fierce strike and I was playing a bass. Again I landed it and took its picture before releasing it. I had a few more casts and then decided it was time for me to make my way home. I noticed as I was packing up that Rob had a bass of similar size to mine. I said my goodbyes to the lads and left for home. Four hours later I got to the AGM and had a good natter with lots of old pals (the main object of such meetings in my view). A phone call from Nigel and a later email from Rob suggested that I hadn't missed anything by packing in early. It looks as though the weather is going to be good this week so perhaps I might venture down to the shore for another go soon.